Without the free flow of information there is no accountability. Public servants, agencies, organizations, and businesses which can conceal the details of their operations from public scrutiny are free of accountability. This applies to many institutions in the United States and in Minnesota, including history organizations like the Minnesota Historical Society. At the Minnesota Historical Society building entrance, looking along John Ireland Boulevard toward the State Capitol in St. Paul, December 4, 2010. Bruce White photo. In 2005, in the case of Lille Ledbetter, involving discriminatory pay, the U.S. Supreme Court ruled that she should have sued her employer within 180 days of being paid less than male employees in the same firm. Unfortunately Lille Ledbetter had no way of knowing that she was being paid less. After all, how many people are able to get their employers to tell them how much other people in their firms are being paid for comparable work? You might get this information eventually, but doing so within 180 days of beginning to work at the firm would be difficult. Effectively the Supreme Court gave Lillie Ledbetter’s employer a free pass from accountability, based on its ability to prevent the flow of information (something that Congress reversed through the passage of the Lilly Ledbetter Fair Pay Act in 2009). Here’s another example. Recently the Supreme Court in the Citizens United case struck down a provision of the McCain–Feingold Act that prohibited all corporations, both for-profit and not-for-profit, and unions from broadcasting “electioneering communications.” The decision opened the door to non-candidate and non-party funding of election ads. Groups can effectively conceal the source of their own funding for broadcasting in favor of and against candidates unless there are specific laws passed to require them to disclose the source of that funding. Where’s the accountability for businesses or other entities that fund such ads if they can conceal their participation? 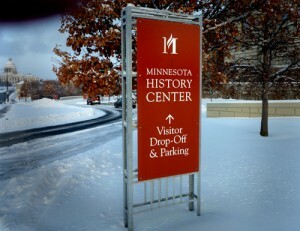 And then, there is the Minnesota Historical Society, a non-profit entity that, at the mandate of the Minnesota State Legislature, performs many public functions including operating a public state-funded library, a State Archives, and a network of state-owned historic sites, being a conduit for state funding of historical grants, and many other activities. The Minnesota Historical Society receives up to two-thirds of its operating budget from the State of Minnesota. Yet the Minnesota Historical Society is not subject to the Minnesota Government Data Practices Act. If, as in the past, the state network of historic sites were operated by the Minnesota Department of Natural Resources, that agency would be required to release to the public information classified as public under the Data Practices Act. But since the Minnesota Historical Society–a 501(c)(3), the oldest such institution in the state–operates those historic sites, there is no requirement that information about those historic sites be made public, even though the sites are funded publicly. Though the State funds many of the Minnesota Historical Society’s activities, details about those activities are not required to be made public. Many people are surprised to hear that the Minnesota Historical Society is not a public agency and therefore not subject to the state’s law about public information. It is nothing new, though the first public occasion on which Minnesota’s public officials ruled that the Minnesota Historical Society was not subject to this law was in 2006 when the matter came before the State Commissioner of Administration through the Information Policy and Analysis Division. The matter came before the Commissioner because of my own request for information from the Historical Society, which the director Nina Archabal had refused to supply. The advisory opinion of the commissioner was simply that “The Minnesota Historical Society is not subject to the requirements of Chapter 13. Therefore, the Society was not required to comply with Chapter 13 in responding to a March 14, 2005, request for access to data.” The commissioner, or rather the lawyer for the Minnesota Historical Society, on whose brief the commissioner’s opinion was largely based, argued that the Minnesota Historical Society despite its funding, would have had to be mentioned specifically in Chapter 13 of state law–like University of Minnesota, which is mentioned in the law–to be subject to its requirements. If state agencies contracted with the Minnesota Historical Society to do all the state functions that it does, the society would be subject to the Data Practices Act. But because it carries out its state functions through the State Legislature, it is exempt from any requirement for public disclosure. There are many issues involved with whether or not the Minnesota Historical Society should be subject to Minnesota’s Data Practices Act. There is some question about whether the State Legislature could make the Historical Society subject to the Data Practices law, given its 501(c)(3) status. However that issue appears to have been settled over one hundred years ago in a legal case which established that the legislature could apply conditions for its funding. If the legislature decided that being subject to the Data Practices law was a condition of receiving state money then the Historical Society could refuse both the money and the condition attached to it, but could not escape that condition if it chose to keep the money. Others have suggested that the being subject the the Data Practices law would have a devastating effect on the Historical Society, making it more fearful and more political. In fact, it is not likely that being required to be more open about its activities or decisions would have a profound effect on most of the society’s activities. The most profound effect might be on those areas about which there is the most public desire for information: how the Historical Society makes its decisions. The Historical Board and the director it appoints are highly political already but also highly secretive in the way they make decisions. The combination of political maneuvering and secrecy often make for an unfortunate mix. Opening the doors to the board’s decision-making processes might make the institution less political, forcing the institution to reveal the reasons for its choices and the fact-based justifications for them. My own own position in 2006 was that the Historical Society was or at least should be subject to this law only for those activities it carries out with state funding. But the Historical Society’s lawyer rejected the idea that the society was subject to the Data Practices law in any way, shape, or form, and the Commissioner of Administration adopted the society’s position. And it should be noted that it is likely that if the State Legislature determined to apply my suggested rationale to information regarding the society that the society’s lawyers might argue that the deliberations of the Historical Society’s board could not be subject to the Data Practices law because the board was a volunteer board and not funded by the state. The only way to achieve openness in the Historical Society’s board’s decision-making would be for the State Legislature to apply a blanket Data Practices requirement to all the activities of the society, as a condition of receiving state funding. 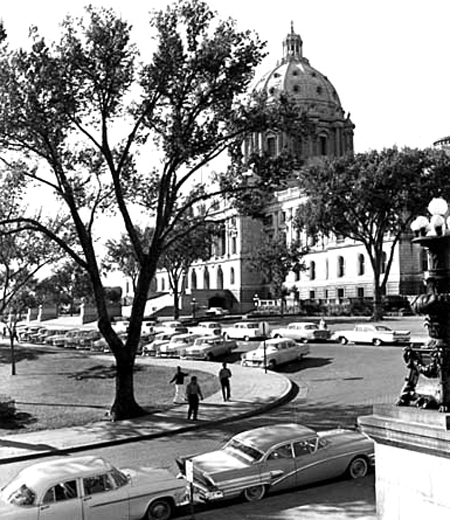 View from the steps of the old Minnesota Historical Society building, around 1959, looking toward the State Capitol, from which the Historical Society has long gotten the bulk of its funding. Eugene D. Becker photo, MHS, neg. no. 2247. The Society may deny or limit access to information if providing access would unreasonably harm the interests of the Society, whether because of the burdensomeness of the request, the practical difficulties of compliance, or the negative impact on ongoing operations of providing access to the requested information. . . .